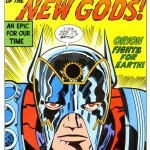 Posted September 8, 2011 in Angelo Worthy, New Gods. Presenting another Kirby inspired track from poet/songwriter Angelo Worthy. Click on image to open track in a new window. For the chosen few. And it don’t stop. Back once again, yes of course y’all. The Uni-Friend with a burner for your Source Wall. Pick up your Solar Phone. The Caller is on the line. It’s easy to rise and shine after the escape artist breaks all the ties that bind. Beautiful Dreamer, I was born to fly. It’s a miracle I’m still alive. I’m like a Spartan child thrown off the edge of the cliff for his impairments, who grew a pair of Aero Disks and didn’t perish. See me soar in the wind, call me the Air apparent. Child of God, call me the Heir apparent. Birth of a new age, call me the Era parent. Aura shines brightly like the hair of Paris. My special effects are set to Alpha. If I met Omega, I bet I would get a positive outcome. They try to stop me, but I breathe the Apokoliptic mist of Miracles and I’m Scot Free. They wanna see me in an early grave. But my skin is a Jack Kirby page. Heiros Gamos, cause of the stigmata. Cover me with panels of armor like Big Barda. Angelo Worthy. We’re in the Fourth World. Apokolips, New Genesis. Rise of the New Gods. Sit in the Mobius Chair. Now you’re sailing on the Dimension Winds. The Winds of Infinity! Taaru!!!!! 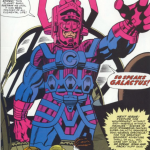 Posted August 23, 2011 in Angelo Worthy, Fantastic Four, Galactus. Please be upstanding L.A. based poet/songwriter Angelo Worthy who presents two rather magnificent compositions inspired by Kirby characters. These songs are part of a series of comic book and video game related works which feature tributes to Batman, Green Lantern, Spider-Man and many others. The full EPIC playlist can be found at YouTube. For more from Angelo check out his pages at MySpace and Facebook. Click on an image to open track in a new window. I sonicaly flame on since you wanted these rays cosmic. Audibly A-bombin’ I bodily paint targets. Wanna see change? Watch as the modeling clay hardens. Unstable Particles all have became solid. I’ve got Ben Grimm tendencies. Thick skin harder than the water underneath penguins feet. And after I speak this word you’ll see pictures. My rhymes will expand your mind like Reed Richards. You can call me Mr. Fantastic. You benefitted when I invented hallucinogenic elixirs. My heat signature forms a fiery baptism. Sound mind and body. Perceive it with your bat-vision. 85% didn’t hear a thing. Brushed it off as a hair brained conspiracy. While the rest with the radar sense used the secret information to aid our quest. Harnessing the technology of the Deviants depends upon the proper heating of the ingredients. Then the surface layers begin to gear up after the subterranean levels erupt. Labels keep the Masters so I make art in an apartment like Alicia Masters. I’m like Black Bolt, speech is impact full. Sound murals hit, you feel like you’ve been tackled. Sounds from the underground like Mole Man. I change your skin color like Soul Man. And give you what you’re askin’ for. 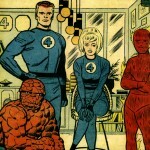 This Rap is for the Fantastic Four. I sit motionless atop the Seat of Power waiting to discover another planet to be devoured, Lest my celestial body become emaciated, my gargantuan hunger must be satiated. So one by one, I leave planets conquered with only occasional interference from the Watchers. I let a deep breath fill the lungs. Then, exhale to let the silver tongue send verses to surf into your person for the purpose of heralding the imminent emergence of the Worldship. My forces effortlessly penetrated your defenses with Power Cosmic that I demonstrate in your dimension. Your attention encourages my body of work, providing proper nourishment for its assured existence. My digestive processes set your skull afire. My stomach functions as an Ultimate Nullifier. The blessing I bestow upon the lay beings is the honor of palliating my cravings. Yet in a matter of time I will again need a planetary life force to sustain me. I’m a day tripper. Clairaudient living embodiment of Jacob Kurtzberg’s illustration work. Aura Tattooed with tech from Taa II. Exoskeletal ancient alien fossils. Deep space exploration archaeological. Got you diggin’ into my chronicles tryna find the bones. You oughta know that my exhalation demonstrates a successful excavation. The Boy of Fire prophesied by Uatu. Some people tell me you watch too many cartoons.